Hurricane Matthew's center was near the coast of South Carolina during the morning of Oct. 8, 2016, when NOAA's GOES-East satellite captured a visible image of the storm. Imagery showed that clouds associated with Matthew stretched all the way up the U.S. East Coast beyond New England. On Oct. 8 at 3:58 a.m. EDT (758 UTC) NASA-NOAA's Suomi NPP satellite passed over Hurricane Matthew and measured cloud-top temperatures. The Visible Infrared Imaging Radiometer Suite (VIIRS) instrument aboard NASA-NOAA's Suomi NPP satellite captured an infrared image of the storm that revealed the location of coldest cloud top temperatures and strongest storms. VIIRS data showed cloud top temperatures of powerful storms as cold as minus 80 F (minus 62.2 C) were found around the center of circulation. Temperatures that cold indicate strong uplift in the storm and cloud tops high into the troposphere. NASA research has shown that storms with cloud tops that cold have the ability to generate heavy rain. A visible image of Hurricane Matthew taken by NOAA's GOES-East satellite on Oct. 7 at 7:45 a.m. EDT shows strong thunderstorms in a tight circulation around the center. Bands of thunderstorms surrounded the center, while clouds associated with Matthew stretched northward into eastern Canada. NOAA manages the GOES satellites and the NASA/NOAA GOES Project at NASA's Goddard Space Flight Center in Greenbelt, Maryland, used the data to create the image. 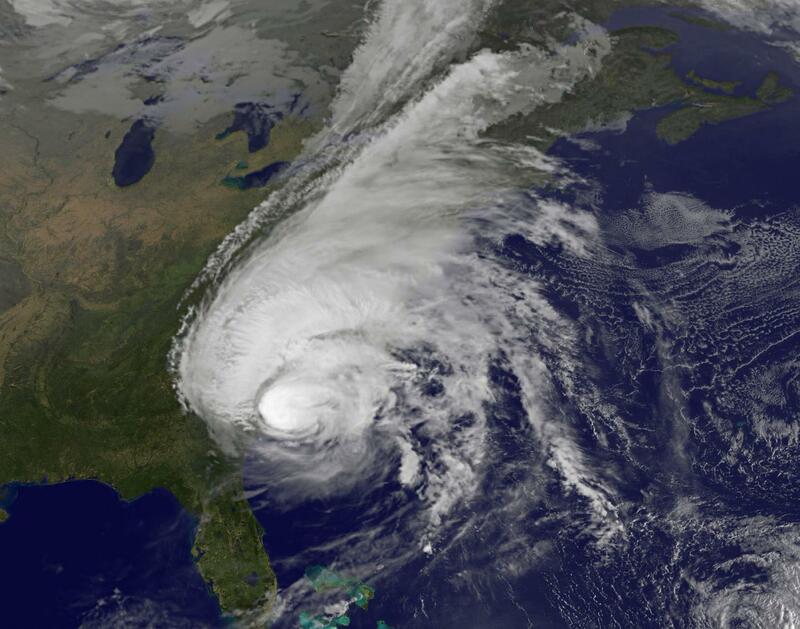 At 8 a.m. EDT a Hurricane Warning was in effect for north of Altamaha Sound, Georgia, to Surf City, North Carolina. A Hurricane Watch was in effect from north of Surf City to Cape Lookout, North Carolina. A Tropical Storm Warning was in effect from north of Surf City to Duck, and for the Pamlico and Albemarle Sounds of North Carolina. At that time the center of Hurricane Matthew was located by NOAA Doppler weather radars, and an Air Force Reserve Hurricane Hunter aircraft, just 20 miles (35 km) south-southeast of Charleston, South Carolina near 32.5 degrees north latitude and 79.8 degrees west longitude. The National Hurricane Center said that Matthew is moving toward the northeast near 12 mph (19 kph), and this general motion is expected to continue today. On the forecast track, the center of Matthew will continue to move near or over the coast of South Carolina today, and be near the coast of southern North Carolina by tonight, Oct. 8. Although weakening is forecast during the next 48 hours, Matthew is expected to remain a hurricane while the center is near the coasts of South Carolina and North Carolina. Hurricane-force winds extend outward up to 45 miles (75 km) from the center, and tropical-storm-force winds extend outward up to 185 miles (295 km). NHC received several wind observations early on Oct. 8. A private weather station at Folly Beach, South Carolina, reported a wind gust of 76 mph (122 kph). At 8 a.m. EDT, NHC said strong wind gusts are also occurring well inland in South Carolina. Orangeburg, South Carolina, recently reported a wind gust of 55 mph (89 kph). The minimum central pressure recently reported by an Air Force reconnaissance aircraft was 962 millibars. For forecast updates and local effects from Matthew, visit the National Hurricane Center page: http://www.nhc.noaa.gov.